Each day starts with a circle time of around 50 minutes where we touch base with each other, check in, see how we all are and share any thoughts or experiences. Show and tell if you like. For some, myself included, there is an impatience to get in to the lab and start the process of exploring and time spent not doing that is time wasted. It’s not, trust me. These few minutes allow us to focus on what is going to happen during the day, as well as reflect on what has happened the previous day or days and gives us some direction as to where we want to be by the end of the coming day. It can allow us time to ask questions about whatever has popped up and to deal with any challenges that any of us are facing. In some cases we don’t realise that we are experiencing challenges until it’s raised by someone else. Because the actual dissection process takes place in teams working on tables, this time also brings us together as people experiencing something together. Bring coffee and pastries if you like, but it’s not an optional extra and you will benefit greatly from it. Day One. 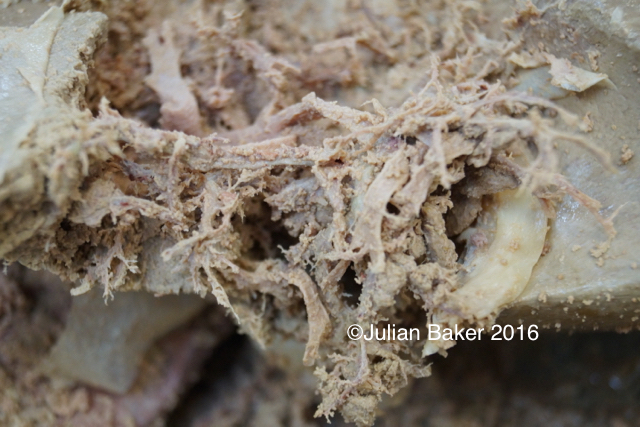 Skin and superficial fascia. This is not an every day occurrence for most people. I recognise that taking a step into a dissecting room is a brave one. I will lead you in to the process gently and carefully and make sure that you are happy with each step. There is no obligation to participate in anything that you do not feel comfortable with and no-one will make you do anything you don’t want to do. It’s worth having a look at the FAQs page, which address some common issues people have. 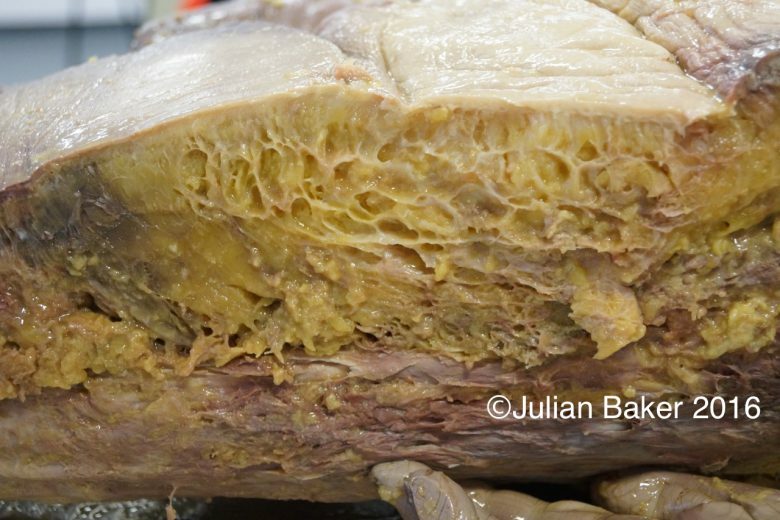 After introducing ourselves to the facility and the forms we will be working with, we start the process of removing the skin and studying the superficial fascia, the adipose layer, beneath. This is a vital session for body workers as these two layers represent the interface that we work on when treating. The scalpel becomes dull when trying to remove skin from the underlying superficial layer, reluctant to loosen its grip. It takes a determined effort to be able to see what lies on the underside of the skin and begin to understand its relationship to the body. At the same time, it gives us the chance to develop the skills required with the scalpel that we will need later in the week. We will then reflect the adipose layer to reveal the deep fascia, studying its connective nature and its differentiated relationship to muscle and adipose. 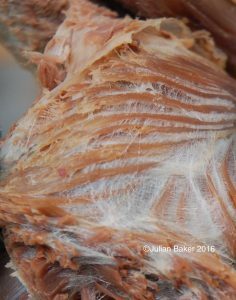 There is some theory relating to the superficial fascia that is also important to have a knowledge of. It’s often dismissed as a fatty layer and our relationship with it in modern society is complicated. We will spend a short time addressing some of the make up of the superficial layer and how it attaches and moves around on the deeper layer of fascia. Days Two and Three. Deep Fascia and Muscle. Where do the trains go? understanding of muscle matches what we see. We will find ways of creating continuity of muscular tissues through fascia and other connective tissues and determine how structures relate to each other. There are a lot of ideas, myths and misconceptions around this tissue. It gets blamed and pointed at for a lot of things, but for the most part is pretty benign. Here we can start to examine and question some of the statements that have arisen over the years surrounding fascia. Are there specific lines as suggested by the Anatomy Trains concept from Tom Myers? Can fascia be released, stretched or otherwise directly treated? These questions may not be answered fully, but at the very least this session will give us some more questions to add to the questions! Similarly the muscle layer has a lot of responsibility placed on it. Often our primary understanding and focus as physical therapists is on the muscles. Attachment, origin, insertion nerve of action and so on. How much of this still applies after the third day? The models we have been presented with over the years are often challenged over days two and three, enabling us to reconsider how we understand functional movement, what a muscle is or really looks like and how it relates to the other tissues we have already explored. Again there’s a bit of theory to look at here in terms of some basic bio-chemistry and some break down of the various other connective tissue categories. We drop into the visceral layer through the peritoneal tissues and explore the connectivity and function of the fascia in creating a related structure from top to bottom in these deep layers. A challenging session for some, the visceral layer is a step away from the areas that a lot of therapists relate to. Yet familiarity with this region is vital to the understanding of the physical responses we see during treatment sessions. This is where it all happens! How we feel and where we feel from has deep roots in this layer. Unless we have attended a course specifically addressing the viscera, it is likely that our study of this area was fleeting at best. Why would the intestinal area have anything to do with sports massage, functional movement, Bowen, or many other things. Our obsession and focus has been muscular. For me, seeing the viscera for the first time was quite unnerving. I felt confident in the muscle layer and had no real knowledge and maybe even a degree of aversion to intestinal tissues. The thorax area, home to heart and lungs was easier to comprehend, but still never really featured in my approaches to manual therapy. How wrong could one be? Understanding these areas became a vital component in my understanding and appreciation of whole body function. Quite apart from anything, it is an incredibly fascinating area and one that has a huge amount of anatomical variation. It’s a big day! The theory here is as endless as the ways that we can explore these tissues. Pancreas and gall bladder, the conjoining of the duodenum and the arterial supply of the digestive organs could take a whole semester. How, if at all, does mechanical function or posture affect the brain and spinal cord? We will examine the fascia of the spine, front and back, its deep muscular make-up and the implications for normal body-wide communication and function.We will explore the cranium and open the skull to examine fascia-like tissues in the brain and dura. 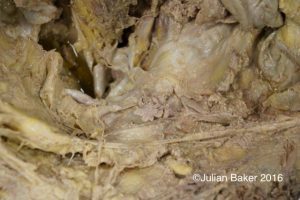 Deep fascial tissue is a densely arranged structure and impacts widely on functions such as respiration and digestion and will be explored during today. In addition to these areas, we will start to piece together the various elements that we have experienced through the week and try to maintain an understanding and appreciation of the whole system that is the human form. Through all of this we keep in mind that the motivation for us being there is to benefit others from the knowledge that we gain. The course runs solely due to the kindness of those who have donated their bodies for us to explore and we repay this kindness by making their gift meaningful. Please note. Classes are only open to suitable health professionals who can demonstrate clear reasons for attendance. You will be asked to provide a CV showing experience, qualification and membership of professional bodies and for a personal statement of intent.